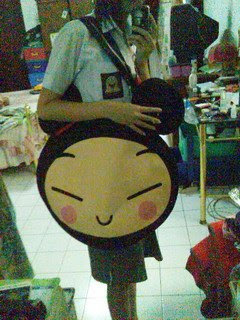 i hate flu.. i just can breath with one nose hole... -.-"
a pucca's face bag.. OMG i ♥ it..! i wanna go around the world... ! which one should i take..? tourism one or the education one..? but im really thinking now... even im accepted, will i take it..? back to stressing thingy... -.-"